Ensure a baby’s safety & comfort with Havells baby hair clipper, and make him the cynosure of everyone’s eyes. It is ultra-quiet, which is especially important to make the baby feel more at ease. 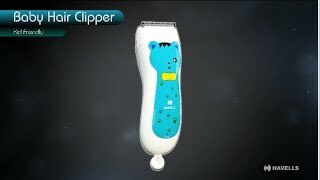 With Ceramic blades to ensure safety, the clipper will not scratch the child's skin. Also, small and lightweight, it is easy to operate and less exhausting for the mom. So, now groom your baby and give him the best haircut at home. Low noise, skin-friendly, detachable head for easy cleaning. Get the Havells baby hair-clipper for your little one.